In Lightning FX, you can margin trade bitcoin by making a deposit and then making a settlement. Amplify the reach of your funds by taking advantage of Lightning FX's 15x (*) leverage capabilities. Increase your trading efficiency and achieve better results by trading with more than your original deposit amount. In addition, you can take a short position, allowing you to make a profit even when the Bitcoin prices drop. Trading is open on weekends and holidays as well. There are opportunities for profit in both bear and bull markets with Lightning FX. Trade Bitcoins with up to 15x (*) the value of your margin deposit. 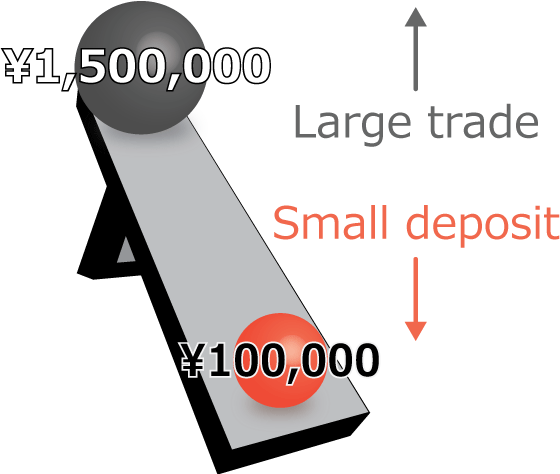 15x (*) leverage means that if, for example, you have a margin deposit of 100,000 JPY, you can trade with the value of 1,500,000 JPY. You can trade with large amounts but be aware that there is a risk you may sustain losses greater than the amount of your deposited funds. Trade 24 hours a day, 7 days a week! Being able to trade on weekends and national holidays is a merit unavailable with ordinary financial instruments. Have fun trading whenever you like at times that best suit you. *Excludes maintenance periods. Please click here for more information. Lightning FX has many other benefits! The minimum order size for Lightning FX is 0.01 BTC. Assuming a rate of 1 million JPY / BTC, you can trade from 1000 yen approximately (if the leverage is 4x, the deposit margin will be 250 yen). With Lightning FX, there are various ways to place orders. By combining an array of order terms, you can place orders with a higher level of freedom than before. Both stop-loss and take-profit orders can be easily placed depending on your combination of order terms, allowing users unable to keep an eye on the Bitcoin market during the day to still enjoy trading. By making use of the bitFlyer API, you can view orders, published trading history, and order books. You can also place new orders, cancel existing orders, and check your account balance. In addition to its web API, bitFlyer also offers a real-time realtime API feed. You can now deposit Bitcoin for use as collateral on Lightning FX in addition to Japanese yen. Your Bitcoin margin deposit is converted to Japanese yen at 80% of the last trade price of the Lightning Spot (BTC) market. Before being able to trade on Lightning FX, it is necessary to make a margin deposit. Lightning FX regularly checks the status of margin deposits. If the retention rate of your deposit drops below a fixed level (maintenance margin), it will trigger a "margin call" or "sell out". For rules on margin calls and sell out, please refer to FX trading rules. When placing a new order*, what is the necessary deposited amount for the order? The method below will show you how to calculate this. (The calculation below is based on a maintenance margin of 10%). * A new order is one that increases a customer's risk. Additionally, the maintenance margin can be determined using the method below. The is the amount of deposited Japanese yen. *The value of your Bitcoin margin deposit is calculated at 80% of the last traded price of Lightning Spot (BTC) market in Japanese yen. This is the current required margin deposit for open positions and new orders. This ratio evaluates the criteria of a sell out. This is the amount that you can withdraw. The smaller of (Valuation Margin - Required Margin) or Margin Deposit. However, a withdrawal may be limited by other conditions. This is the profit or loss valuation for the open position. This is the total amount of unsettled swap points. This is the fee for the trade. This is a new order creating an open position. This order repays the amount of an existing open position. This is the required amount of margin deposit for the open position. This is the Required Margin for a specific order. 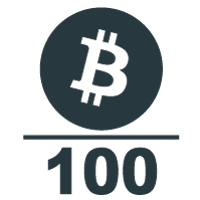 The maximum number of positions you can hold are 1,000 BTC-FX, 1,000 BFT per sheet (including order amounts). Click the ‘BTC-FX’ tab in the upper part of the Lightning screen. Next, display the menu by selecting ‘Menu’ from the upper-left section of the BTC-FX screen. Click ‘Funds’ from the menu on the left of the screen. Click the 'Lightning FX/Futures account' tab, enter the amount of your deposit, and click 'to Margin Account'. Return to the trading screen and check the amount of your ‘Margin Deposit’. You can carry out trades to a value of 15 (*) times your deposit. Below is an explanation of the information shown. This is the P&L from the beginning of the year until now. This is the P&L from the beginning of the month until now. This is the P&L from AM 0:00 (JST) today until now. Currently, there are no fees for buying and selling on Lightning Futures. Swap points occur separately. For more information on swap points, please refer to the Lightning Futures User Guide. Before trading, please carefully read Notes on Lightning FX and Risk. Please refer to our circuit breaker explanation page for details on our measures for preventing price volatility caused by erroneous orders or otherwise.